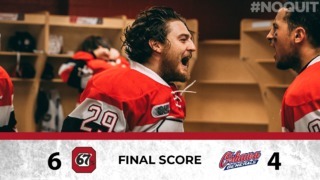 Sasha Chmelevski led the way with a hat trick, while goalie Mikey DiPietro made 19 saves in a 7-1 win for the 67’s over the visiting Kingston Frontenacs on Wednesday night. The teams traded goals early in the game with Chmelevski opening the scoring with his 16th of the year before the Frontenacs briefly tied it on a goal by Ian Derungs. The San Jose Sharks prospect would score twice more before the second period was three minutes old to give the 67’s a lead they wouldn’t give up. Marcos Rossi scored twice, while Austen Keating and Lucas Chiodo also found the back of the net for the Barber Poles. 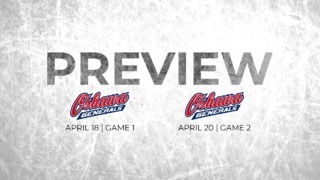 The 67’s return to action Friday night at 7 p.m for the first of back-to-back home games against Guelph and Niagara (Saturday, 7 p.m.) at The Arena at TD Place. 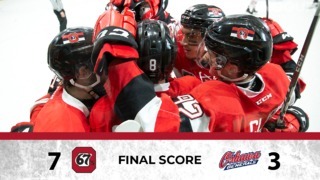 The 67’s were 2-for-3 on the powerplay on Wednesday. The 67’s had a 36-23 edge in the face-off circle, with Mitch Hoelscher leading the way at 14/18. Marco Rossi has a two-point edge in the rookie scoring race, though he has played 10 fewer games than Sarnia’s Jacob Perreault in second place. Nikita Okhotyuk had three assists against Kingston. Austen Keating had a goal and two assists. The top four players in terms of plus/minus in the OHL are 67’s: Felhaber (+45), Keating (+44), Rossi (+37), Rippon (+37).